If you're looking for a midsize SUV with an additional row of seating, consider getting one of the Ford Flex models that we carry at First Choice Ford. These vehicles are versatile in terms of cargo space, are built with capable engine components, and incorporate high-tech features. There's comfortable seating for up to seven passengers in the Ford Flex. Seven seats are the standard option, as the Flex can come with a 60/40 split folding bench seat in the middle row. If only six spots are needed, the Flex can come with 40/40 bucket seats in the middle. This provides the room for a pass-through to the back. All of the rear seats can be folded down in case cargo space needs to be maximized. Up front, the seats can come heated and ventilated. 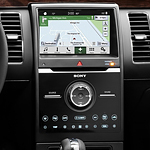 Steering wheel-mounted controls make it easy for the driver to make adjustments to the infotainment system.